All aboard, me hearties, for a non-stop, action-packed theatrical pirate adventure, with live music, puppetry and dastardly dinosaurs. 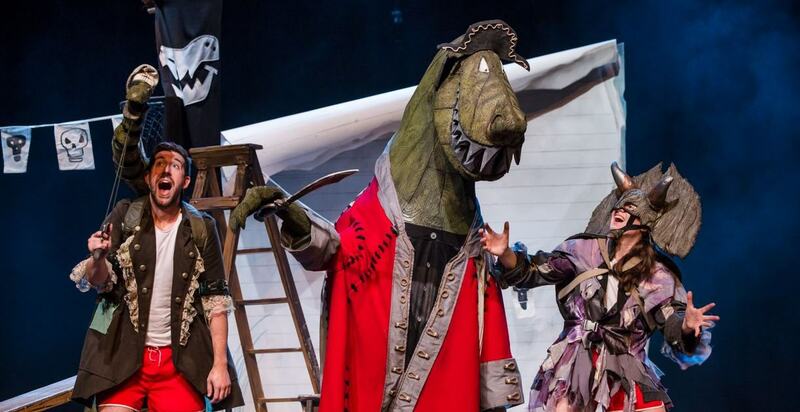 When Flinn, Pearl and Tom are in the middle of their school play, their old nemesis, Mr T the T-Rex, appears and kidnaps the children forcing them to hunt for the secretive Magic Cutlass – a sword that grants the holder any wish! The children are whisked away for another fantastic adventure to a world of devious dinosaurs, deep sea dangers and smelly sausages. Will fearless Flinn be able to outwit the pirate dinosaurs, will pirate Pearl be brave enough to battle the dangerous dinos and will terrified Tom be back in time for tea? Based on the bestselling Captain Flinn and the Pirate Dinosaurs books by Giles Andreae and Russell Ayto.